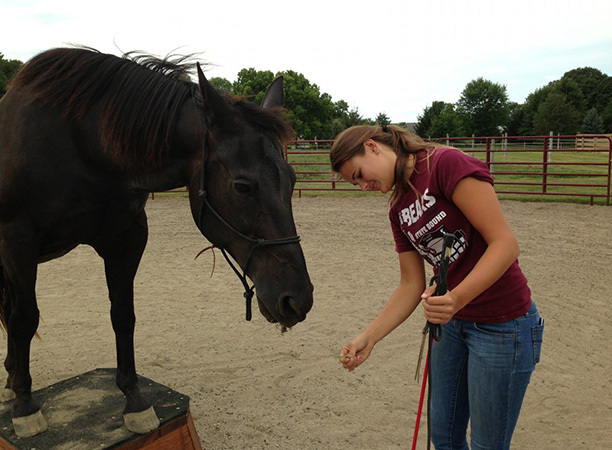 Equine assisted learning is an experiential learning approach which promotes the development of life skills. This focus on life skills can be related to academic achievement and classroom behavior, personal growth and exploration or professional pursuits such as leadership development, team building and executive coaching. The work is facilitated by a professional who has training and certifications that qualifies them to work safely with horses, have knowledge and skill in experiential learning methods and have been trained in facilitation. This does not mean that a facilitator must be an expert horseman and expert in all things human development. This does mean that they need to offer safe, life skill directed sessions for their students. Often session are co-facilitated by a team of professionals; one who is the equine specialist and one who is the human specialist. Each member of the team has the necessary skills to work with the type of individual or group in the session. Fore example, if a horse professional is hosting a team development session for a corporate group and has not worked in leadership development before , that horse professional would partner with an expert in leadership development to facilitate the session as an equal partnership. Sessions may also be facilitated by someone who is called duly-qualified. A duly-qualified professional is someone who has both expertise in working with horses but also has additional training in human development and is qualified to work with a specific individual or group. Any duly-qualified professional must have adequate understanding of horse behavior, management and safety as well as an equal understanding of human dynamics and facilitation. This is to ensure that the professional can keep students safe and also create appropriate goals and corresponding activities. If you are not sure whether or not the professional is qualified, ask them what their credentials are and research their governing organizations to see what standards they follow. The work of Debbie Anderson and Blair McKissock of Strides to Success has been to help PATH Int’l. develop the accepted professional competencies and operating guidelines for EAL. These competencies are the foundation for all of the professional workshops and education HorseWork at Strides produces. Learn more here. What does an EAL session look like? Most EAL sessions are done on an individual basis unless working with groups. 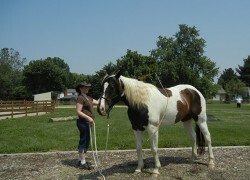 Each session involves horse interaction facilitated by the professional or professional team. 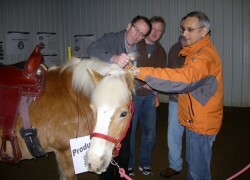 Though there is always a lesson plan however, a good facilitator will often follows the horse’s lead. Often the activities are problem solving based, relationship building or observation. Though students can learn horsemanship skills through the sessions, it is usually not the primary goal. Most goals are focused on the development of life skills. Lessons are often ground work but can include a mounted component.